Unlike neighbouring holiday resorts, Dalyan is a largely undeveloped, tranquil village offering a significant number of natural and historical attractions, as well as classic Turkish friendliness and hospitality. Due to the fact that nearby Iztuzu beach is one of the world's few remaining breeding grounds for Loggerhead (Caretta Caretta) turtles, an effort has been made to conserve the area's astounding natural beauty. The town is set on the winding Dalyan River that flows between the Mediterranean Sea and Lake Koycegiz, and on the other side of the river are the ruins of the ancient city of Caunos, dating back to the 3rd century. A Dalyan holiday must is a boat trip to the 2.5-mile (4km) beach (about a 40-minute journey) that transports visitors through tall reeds, to 2,300-year-old Lycian cliff tombs and the ruins at Caunos, and finally to the large sandbar at the turtle beach in Koycegiz. A quicker, but less scenic ride is by dolmus. Nearby thermal springs at Sultaniye, and the Dalyan mud baths are also not to be missed and make for an out of the ordinary holiday experience. The surrounding wetlands are a haven for a variety of wildlife and birds, and the town is offset by a backdrop of pine-covered mountains and lush fields, making Dalyan a perfect destination for nature-lovers. For those looking to party until dawn the busier holiday resorts such as Marmaris would be better suited, but for the more discerning traveller there are plenty of activities and excursions to enjoy, local delicacies to savour, and spectacular scenery to delight in while on holiday in Dalyan. The Dalyan local market on Saturdays provides an excellent way to pick up bargains while on holiday; as with anywhere in Turkey, haggling is key and there are unbelievable deals to be had. There are several small shops, including local arts and crafts and carpet dealers, and there is also the usual range of very cheap, but fake, designer goods. There are also several mini supermarkets. There are a number of restaurants catering for a range of tastes in Dalyan, including several that offer tasty traditional Turkish dishes. Unlike many resorts, this is not the place to look for British style food or McDonalds. Paradise Restaurant is the best place to go for fish and chips, though. Some favourites include Ali Baba's, La Perla, and Simarik café (formally Mulberry). Riverside Restaurant has beautiful views of Caunos. Dalyan is not the place to come on holiday for a buzzing nightlife, but there are several bars and a few clubs (including Sweet Sixteen and Zilli), and many establishments have regular Turkish nights offering up a more traditional experience of belly dancing, traditional music, and special food. 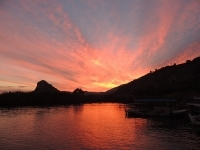 There is plenty to see and do on holiday in Dalyan. Boat trips are immensely popular, as are jeep safaris, mountain biking, sea kayaking, paragliding, fishing, snorkelling and more. A definite holiday must is a microlight flight over the spectacular Dalyan Delta, providing incredible views and possible turtle spotting on the golden sands of Iztuzu beach, home to the rare Caretta Caretta or loggerhead turtle. Wildlife enthusiasts will also enjoy the fantastic bird-watching opportunities. For the less active, the Dalyan hot springs and mud baths provide relaxation, as does a visit to a Turkish hamman for a massage and Turkish bath. Relaxing on the spectacular Iztuzu beach and bathing in the warm, shallow water is also a must. History buffs will enjoy the fascinating Lycian cliff tombs that house the kings of Caunos, and at Caunos itself the remains of this once large port can be seen, including a theatre, temples, churches and baths. For those looking for more action while on holiday in Dalyan, there are regular dolmus trips to neighbouring resorts and towns such as Marmaris. Beach BBQs are also a favourite (they can usually be booked through a tour operator or hotel). Dalyan can be a bit more expensive than neighbouring holiday resorts and as it is a more family orientated resort, party animals looking for late nights and pumping clubs should be head elsewhere. Mosquitoes can be a problem.